The right hand moves forward as if to once again grasp the outer right corner of the face-down card in order to turn it face up. Instead, the card is switched. 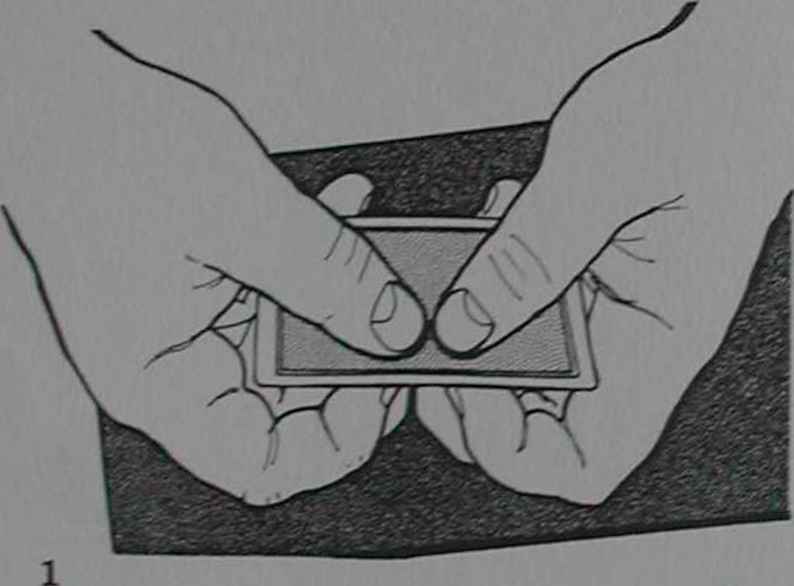 As the right hand moves over the protruding card, the right first and second fingertips curl inward and clip the outer end of the palmed card (fig.6). 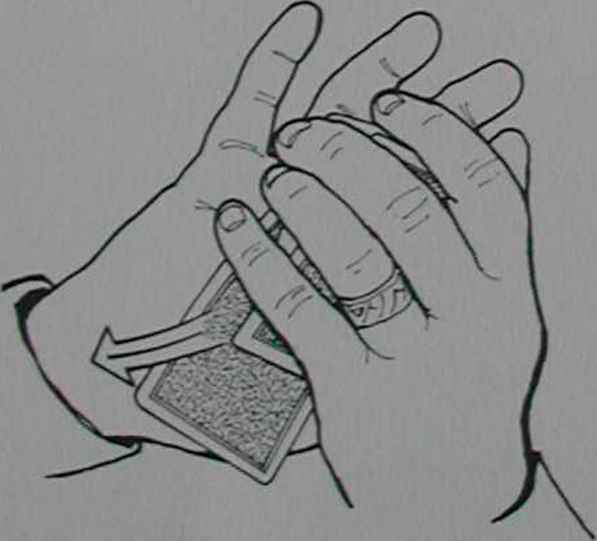 The instant the right hand shades the projecting card from the audience, the left thumb rapidly slides it inward, flush onto the top of the deck (fig.7). This must be done smoothly and with precision. right firSt and second fm§ers straighten, rotating the palmed d^ona lv li^ ,Canymg ^ °Utward (fl§-8)- ^ is placed onto the^deck in the diagonally outjogged position and retained there by the left thumb. Color changes are crowd pleasers. They evoke a visceral reaction in the audience which, if you think about it. drives home the point quite well that simple tricks often generate the greatest response. When the French master Trevvey (you can see his chapeauography act in Lang Neil's The Modern Conjurer. 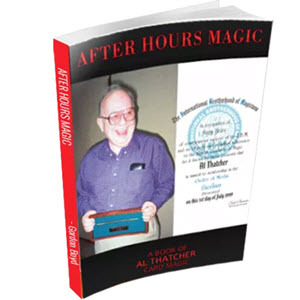 1903) invented the color change as we know it at the end of the nineteenth century, he literally changed card magic forever. Steve's contribution to the genre is a dandy combination of Houdini s Change (a.k.a. The Erdnase Second Transformation) and the rear palm. If you have very dry skin, and cannot do a rear palm, then further reading will be academic. 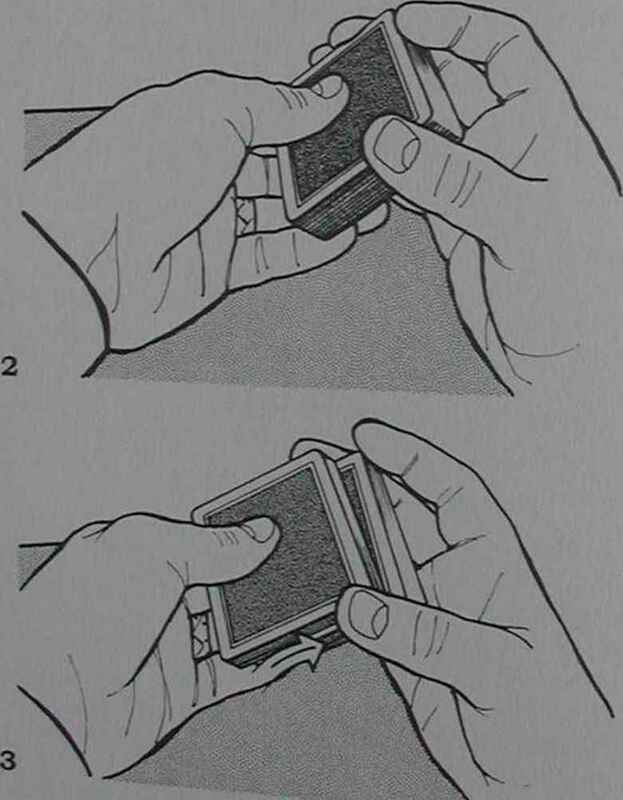 Hold the deck face up in your left hand in dealing position. The change will be more effective if the card on the face of the deck contrasts greatly with the card second from the face. Begin by moving your palm-down right hand, fingers spread wide like a starfish over the deck (fig. 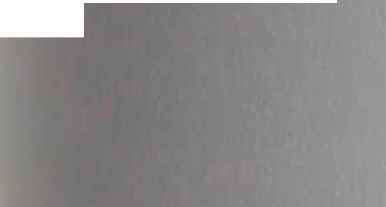 1 is an x-ray view). 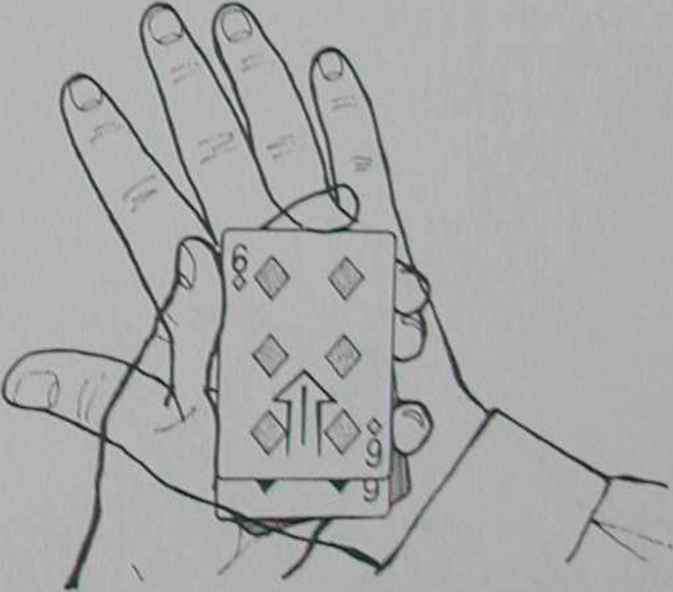 The right hand comes to rest so that the pad at the base of the pinky is pressing lightly downward on the outer right corner of the face card. the Crimp on the other long side of the card. Repeat with all eight cards. 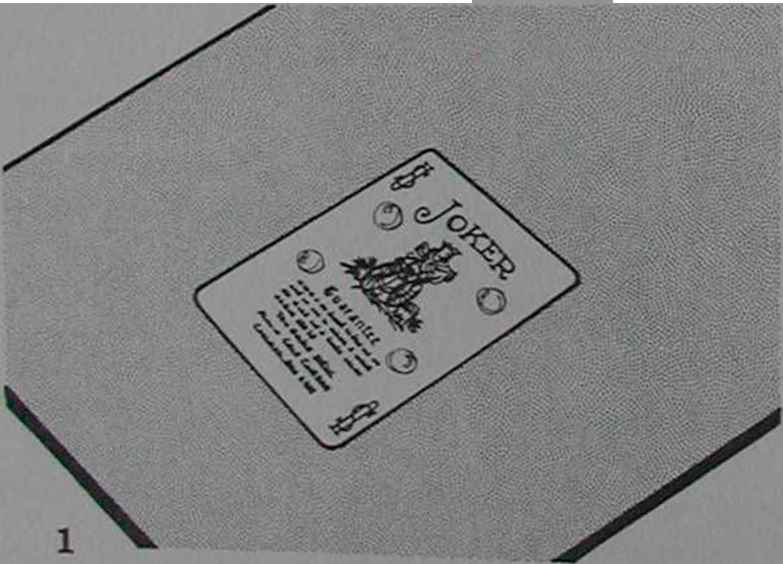 Insert the eight cards into the deck at different locations and use it for a while in other routine* In a few days, the work will almost disappear—no trace can be seen if the cards are examined. It is also permanent, and until the day you toss the deck away you will be able to instantly locate those eight cards without looking. 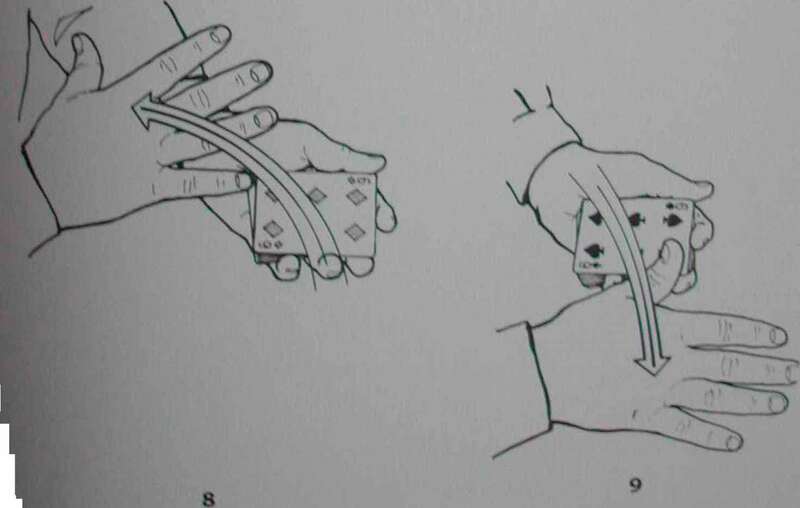 The culling and stocking procedure uses one, two, and sometimes three, different shuffle sequences: The Basic Shuffle, The Exception Shuffle, and The Wasted Shuffle. The initial step is to bring one of the eight target cards to the top of the deck. Table the cards, face down, in position for a riffle shuffle. 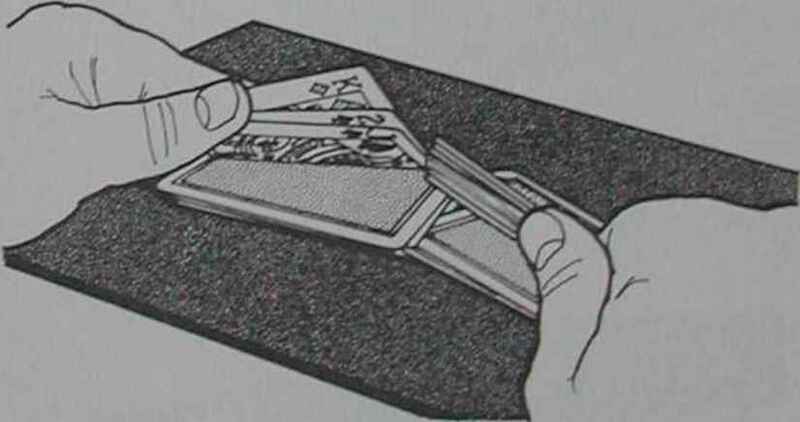 Your right hand approaches the deck and, with a light touch, plucks off a portion of the cards between the thumb, at inner long side, and second finger, at outer long side. 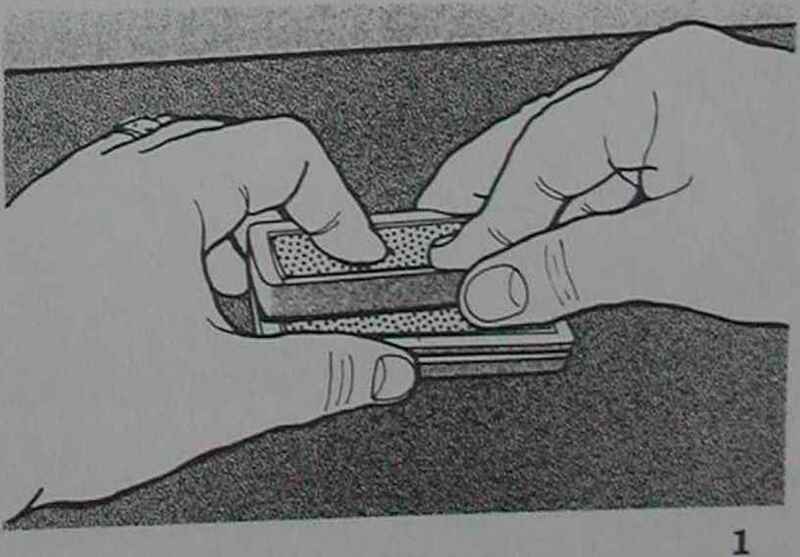 The light touch is vital in order to split the deck at one of the eight waved cards, which should be on top of the still-tabled portion afterward. This will require a bit of practice, however you need not be perfect on the cut, and that contingency will be explained under The Wasted Shuffle. For now, assume that you have succeeded in cutting to one of the eight target cards, and it is on top of the portion of the deck which remains on the table. 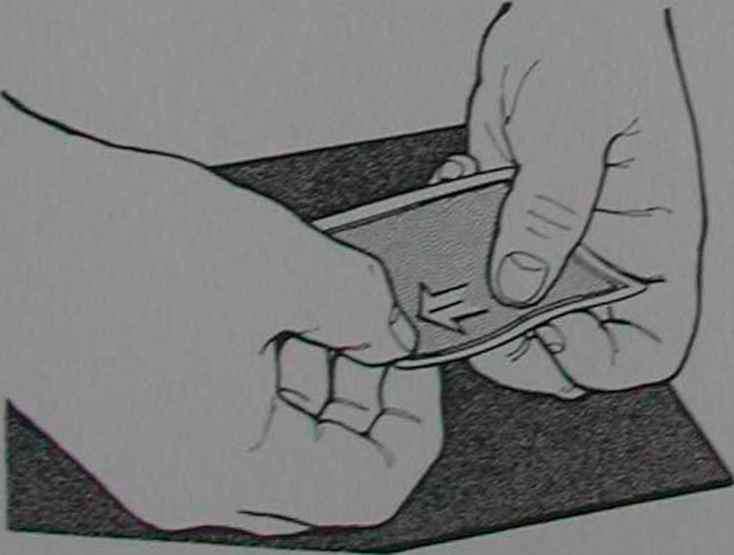 Your right hand tables its cards to the right, and both hands grasp the halves in position for a riffle shuffle. First the different shuffles will be broken down in detail, and then the routine will be explained. e 11 tact from the left-hand half. Square the deck. A target card is ^P^r^ro^ fifth .He top. D V Qt,„fflfi three more times (the final time only three cards are Repeating The Basic Shu:me i mll complete the cull and stack as long allowed to fall on ^^ ^J^^ happen: you cut the deck in preparation for ? thTleft hand half. If this happens, then you must do ... . The Exception Shuffle: The first step of The Exception Shuffle is, when you see that there are two target cards on top of the left-hand half, to simply note that fact and continue as if it is a regular Basic Shuffle. That is, allow four cards from the left-hand half to fall last, then square the deck. Two target cards are now on top of the deck, with whatever else you've culled and stacked so far directly beneath them. Now let's go back a step and assume that you have accidentally cut to a target card. After l 'Exception Shuffle, there will still be two target cards on top of the deck. Perform yet another Exception Shuffle to split and stack them-This time, hopefully, you wall have avoided cutting to a target card. " The second step in The Exception Shuffle is to cut the deck again, trying to avoid cutting to one of the target cards. It is not a problem if you do, however you will have to execute this second step of The Exception Shuffle yet again. Assume, for the moment, that there is an indifferent card on top of the left-hand cards. 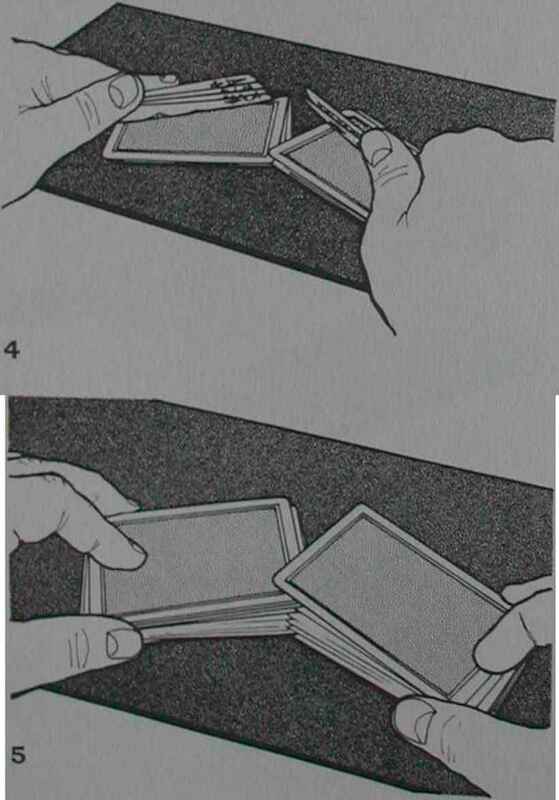 Begin a Basic Shuffle and end by holding back the usual four cards with your left thumb and, this time, two cards with your right thumb (fig.4). 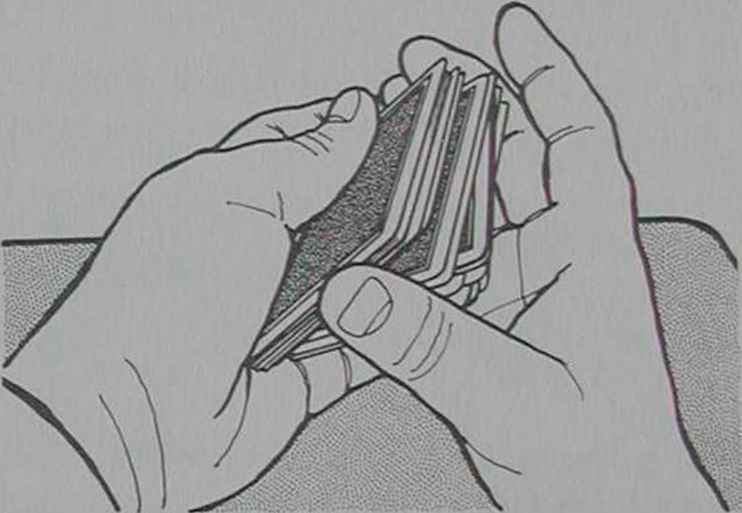 Allow one card to drop from the bottom of the four cards on the left, then let a single card drop from the right, then three cards from the left, then the final card from the right (fig.5). The Wasted Shuffle- On il eight target cards, the shuffle .iTn/^f, mstances when you fail to cut at one of the shuffle is, literally, wasted. As the cards interlace, you will be able to see the upper card of the left-hand packet. If it is not one of the eight target cards, simply allow the left-hand cards to run out early and a large block of cards on the right-hand side (the stacked group) to fall on top. This preserves the stack. The only problem which arises when you miss a cut and have to execute The Wasted Shuffle is that it takes up valuable time. The routine, in which you apparently fail to cull the cards, but make good by having secretly stacked them as well, begins when you hand the deck to the spectator and ask him to thoroughly shuffle it as you say, "I'm going to give you a demonstration of culling, and I'm going to see if I can cull, you won't believe it, a full house." Take the deck back from the spectator. "And I'm going to do it with a riffle shuffle, and I'm going to make the riffle shuffles look as innocent as I can." Execute the first step, which is just to cut to a target card and do a normal shuffle so it ends on top. As you say the following, begin with The Basic Shuffle and execute the other two shuffles as needed (if needed) to cull and stack the four additional cards, "They're all going to look as innocent as that ... I hope. I'll tell you in advance that I'm going to try and get Kings and Queens in as few shuffles as possible, but please bear with me because I'm not trying for four of a kind, but I'm trying for a full house. I think I've got them, but I'm not sure, let's see. I should have Kings and Queens—a full house." It doesn't take Steve long to do the minimum of six shuffles, and adding a shuffle or two more if needed only takes another few seconds. Remove the top five cards and display them proudly toward the spectator as if expecting him to see a full house. When his face fails to register amazement, look at the cards yourself for the first time and act a bit disappointed that you've apparently failed. Replace the cards on top of the deck and hand the cards to the spectator. Ask him to deal out four hands of poker, dealing the fourth hand to himself. When he finishes, ask him to turn over his hand to reveal the full house of Kings and Queens. This is for a sophisticated audience-a group that knows a little about playing cards and maybe even a bit about cheating. The spectator is allowed to shuffle the deck and deal out five hands of poker, with all the cards face up. 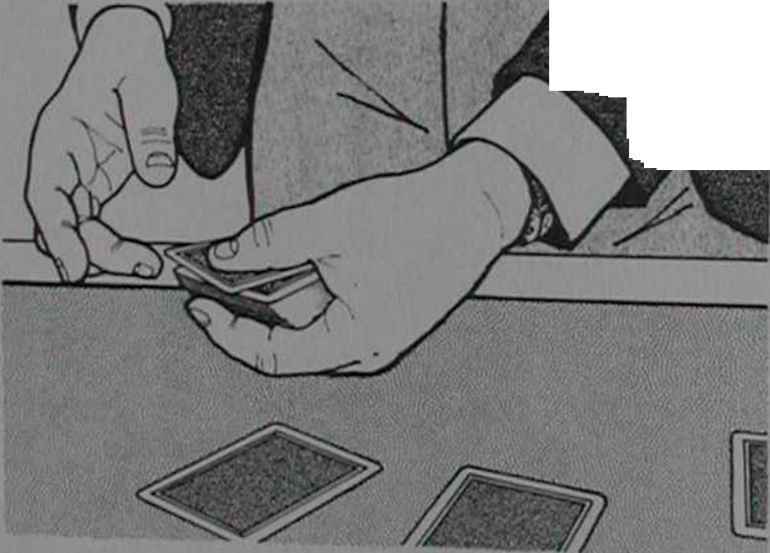 The performer states that it is at this point that most cheating occurs, because now is the time the card sharp looks over the hands to see what cards he can cull for the next deal. He explains that he is looking for Aces and Kings in order to deal a full house to his partner, who is one of the other players. He gathers the cards, and Overhand Shuffles them a few times, before dealing out five hands. When his partner's hand is turned over, it contains the promised full house. Magicians have since exlLen^l Unfortunately this can no longer be done. but not until Bob Nelson rW T . many thin§s on the surface of a playing card. P acucal. In Steve s hands, very practical. To prepare for this routine obtain of . of this process, not only will you have cTJed^tfuZfcllt ^ At tbe end dandy d.penser of sorts, for the fingernail bu^tL^^^'^^^r it,; pad that you no longer need the tube all the time. After^feT^ takes quite a bit of work), the friction will begin to wear on the silicon coating TOs s repaired by merely buffing the cards with the fingernail buffer. Four Ices in a borrowed deck could be prepared in the bathroom in half a minute. Cards prepared in this way wall not have as long-lasting a silicon finish, but that doesn^ matter because those on-the-spot applications are for one-time use. Once the Aces and Kings have been prepared, allow them to dry (overnight, if possible). Then, insert them into different parts of the deck. The deck may be used for sundry other tricks before this one with no telltale clue that it is prepared (and it may make any number of other tricks considerably easier—The Multiple Shift, for instance, becomes unnecessary). If the deck is held face down, and pressure applied to the top as the cards are spread, the deck will break in blocks with an Ace or King at the face of each block. A very fine and subtle handling of Steve's for locating the blocks and culling the cards during Overhand Shuffles will be used during the demonstration. Begin by giving the deck to the spectator and saying, "Shuffle the cards. What I would like for you to do is to deal out five poker hands face up. And, I want you to know that when cheaters cheat, a lot of times people don't realize that the cheating starts about now. It starts after the showdown, when the pot is decided. That's when the cheat sees which cards he wants to get in his partner's hand on the next deal. Guide him to follow your instructions so that the deck is shuffled and then he deals out five face-up poker hands. Say, "I have seen the cards I want to deal to my partner, and I'm going to gather the cards up." Circumstance will almost always position at least one Ace or King (the target cards) either on the top or bottom of one of the face-up poker hands. Sometimes you will get lucky and two of the target cards will be in accessible positions. The former bit of mathematical good fortune will save you one Overhand Shuffle during the stacking sequence, while the latter will save you three. Let s assume for the moment that only one Ace or King is in a good position. 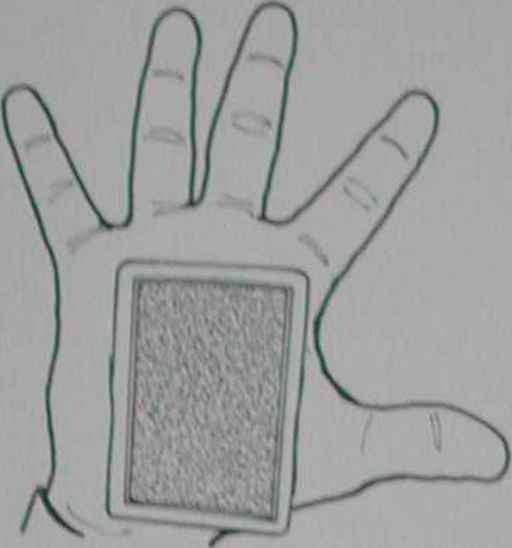 Gather the five hands so tha- die target card is either at the face or rear of the reassembkd cards. If it is at the rear then turn the reassembled packet face down and do an to the bottom, then drop the balance of the packet, the bottom. If, instead, the target card is on the face ol me r simply turn it face down and then drop the balance of the deck on top. the hands (scooping up half at a time, etc-) wdl enable > P^ ^^ w&y a the face, or both at the rear, or one on the top andlone° quick Overhand Shuffle will bring both to the bottom if necessary. ^C^TLTXretso the target card is brought to the face or rear of the reassembled group, and finally to the bottom. Let's assume that you have one target card on the bottom of the deck since this is the most likely scenario. Place the deck on the table, face down, and say, "I don't know if you noticed that there was a preponderance of Aces and Kings among the cards, so those are the cards I'm going to look for. Fm going to try and get them in an Overhand Shuffle." at block shown to now its in slide side (also snowTT illustration 3), and begins to sua it out from beneath the deck r normal shuffle fashion. If you a "
' ^ U WlU leave two target cards on the bottom of the deck. casual. The patter to cover the following six shuffles (two each to locate the three remaining cards) will be given at the end. It sounds as if it will take you quite a while to do six Overhand Shuffles, but it won't provided you avoid long runs of single cards when shuffling off. One or two quick chops is sufficient, followed by tossing the balance on top of the deck. You'll see that each shuffle only takes a few seconds. Second Shuffle: Because two of the target cards are now on the bottom of the deck, a Slip Shuffle will no longer suffice. 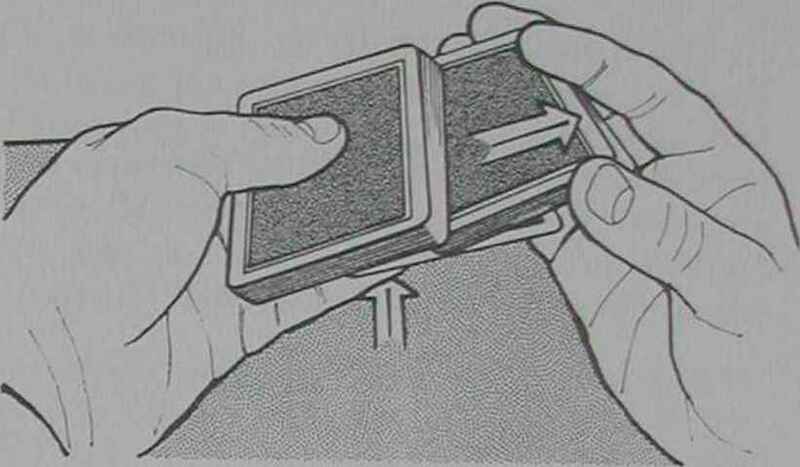 The remaining three cards necessary for the full house are handled in exactly the same manner and will each require two shuffles. This is the first. Your left thumb and fingers squeeze the deck, causing it to step beneath another of the slick begins the Overhand Shuffle by withdrawing the bottom of the deck (all the cards that have stepped) with the two target cards on bottom. Run a few cards on top of the deck, then toss the balance on top, injogging it slightly. The two target cards are directly above the injog, and the third target card is on the bottom of the deck. 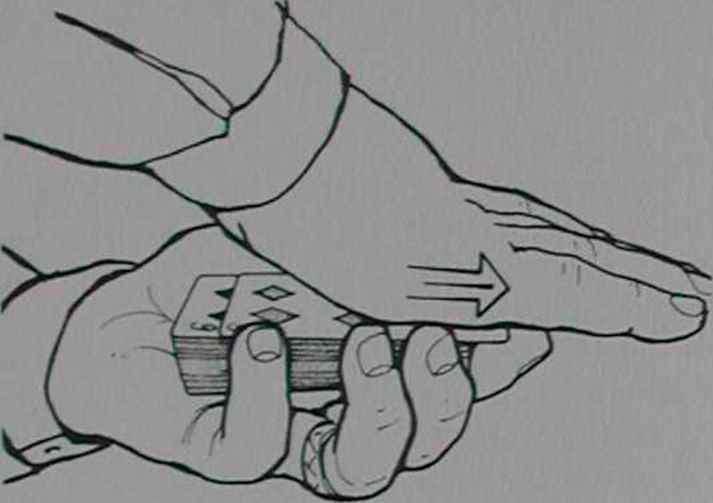 Third Shuffle: Grasp the deck in Overhand Shuffle position, your right thumb pushing against the injogged cards to separate them from the lower half (fig.5). Execute a Slip Shuffle, your left fingers holding the third target card in place as your right hand withdraws the bottom of the deck. The injogged portion will now fall flush with the third target card, bringing the three located target cards together. The right hand completes the shuffle with two quick chops, then tosses the balance on top. The Fourth Shuffle: Repeat the Second Shuffle. Squeeze the deck to step it at the fourth target card, then withdraw the lower half and injog as it is thrown on top. The Fifth Shuffle: Repeat the Third Shuffle. Separate the deck at the injog and execute a Slip Shuffle to bring the fourth target card together with the first three, then shuffle off. The Sixth Shuffle: Repeat the Second Shuffle. Squeeze the deck to step it at the fifth target card, then withdraw the lower half and injog as it is thrown on top.
. thr- Third Shuffle. Separate the deck at the injog and The Seventh Shu/j^e: Rcpc^ tne ^ ^^ ^ together with the first four, then shuffle off. ,,, . . , „„„¡hi. tar tret cards, which should comprise either a full house or fo'ur of a kind are now on^fe bottom of the deck. Steve s Combination Bottom Deal is used to include the trick. The slick cards make the Bottom Deal easier to do, for they slide out from beneath the deck with less faction. _ "partner's" hand is positioned fourth because it is the farthest to the right. Both hands move around the table as you deal, the left hand trailing the right. 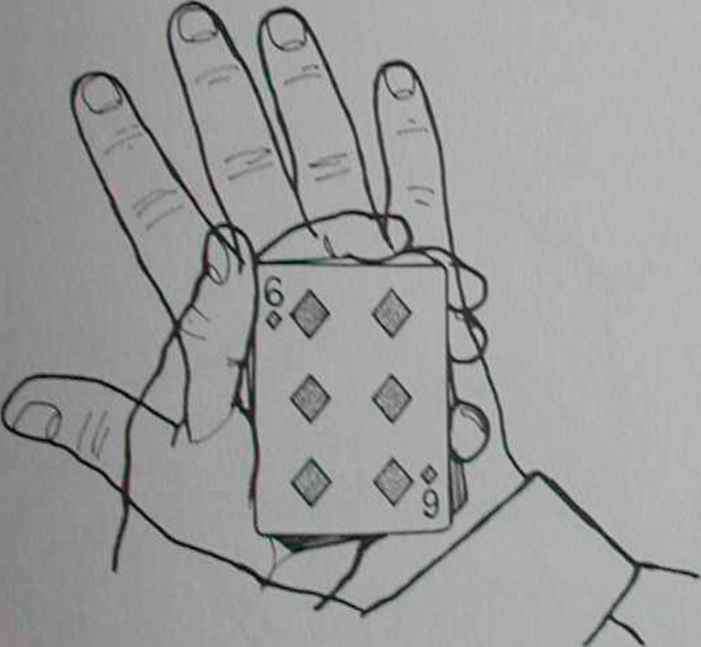 The fourth hand, on the right, is the optimum position for your left hand to be in at the moment of the false deal since the right long side of the deck is completely obscured (fig.6). This can hide a multitude of sins. After five cards have been dealt to each hand, place the deck aside and slowly turn over the fourth hand to reveal the cards dealt to your partner, a full house or four of a kind. Overhand Shuffle to locate the first Ace and then reveal it as you see fit. 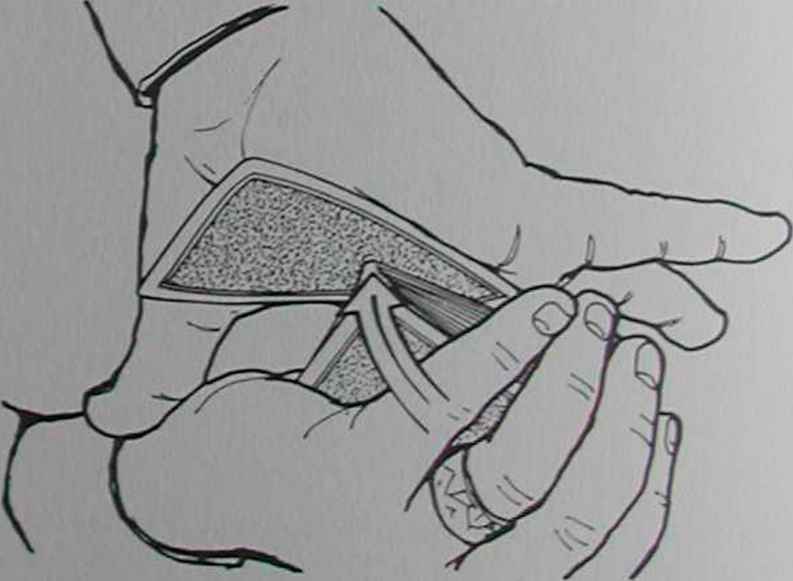 A second shuffle locates the second Ace, etc., with a shuffle between each revelation locating the cards as needed. The notion of stacking your hand in a ten-handed deal is one that was most certainly designed by Dr. Jacob Daley to enthrall other magicians. He did not however, create the most deceptive version of the trick—Steve Draun did, and promptly fooled his friend Ed Mario with it (as noted in The Ten Hand Poker Stack, Mario, 1974). Steve's version succeeds so well, takes so little work, and is over so quickly, that it has shocked many of the best card experts in the country. To perform, openly spread through the deck and remove the four Aces. Display them. Turn them face down very cleanly and fairly drop them on top of the deck. During this, say, "I'm going to place the four Aces on top of the deck." Turn the deck to Riffle Shuffle position and say, "I'm going to try and stack them for ten hands and I want you to count the shuffles." Say this in a deadly serious way, as if you are about to endure terrible muscular cramps in all ten fingers. Execute the following simple shuffle of Mario's to add nine cards on top of the Aces. Your hands grasp the opposite ends of the deck. 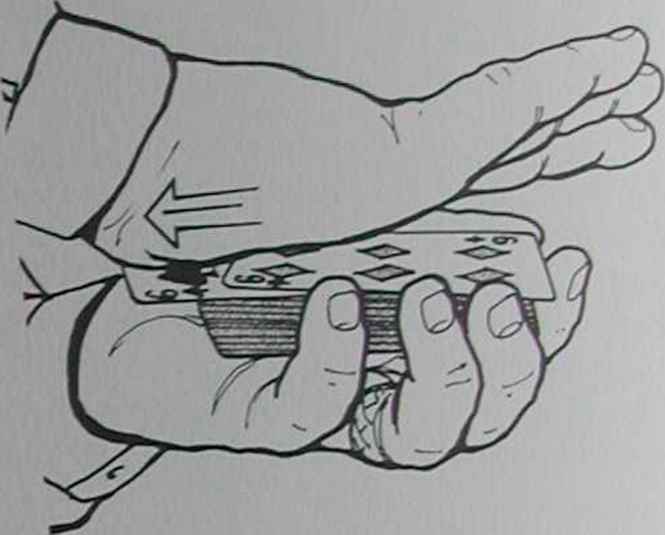 Your right thumb breaks the deck at about center at the inner side and lets five cards riffle off onto your left thumb one at a time (fig. 1). Your right hand takes all the cards remaining and cuts them to the right. Your left thumb now holds a break beneath the top five cards of its half. Begin shuffling normally, allowing the halves to mesh together, and hold back enough of the cards in your right hand so that you can be assured that the Aces will fall last. The first Ace has been set to . Unit Contror [Seconds, Centers, and th ce Aces are bluffed using Marios . Bottoms, Mario, 1960). Steve has made several vital improvements to the Mario technique, including eliminating the need to obtain a break in advance when working with a block, angling the blocked-off packet so it doesn't flash on the right side, and providing strong misdirection for the left thumb's blocking-off action. Without a way to cover this (Mario suggests the rather unrealistic notion of just doing it during the course of the deal), the technique remains merely something to be read in a book. Steve uses it. 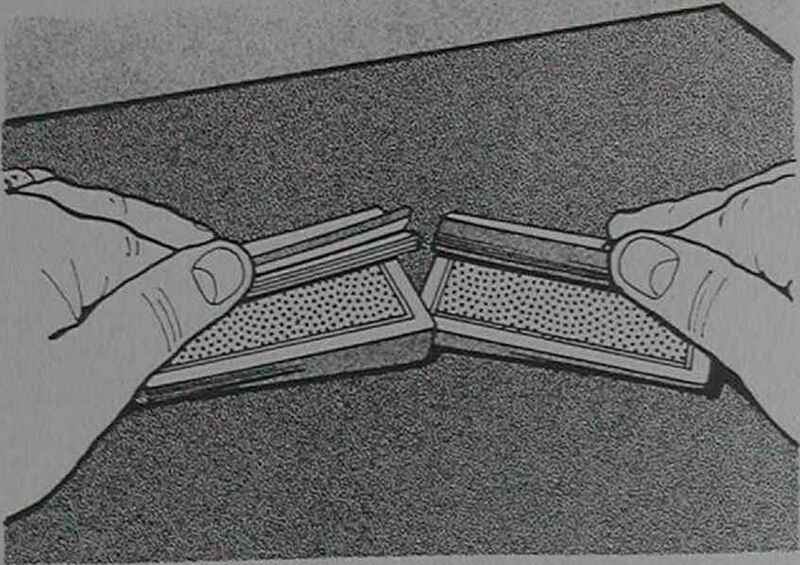 The left hand grips the deck in a normal dealing grip with the exception of the little fingertip, which is extended slightly above the top of the deck (fig.3). Tilt the top of the deck toward you very slightly, just enough to take it out of the spectator's line of vision.